My voice no longer my own. 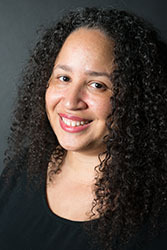 LH Moore’s short stories have been published in all three Dark Dreams anthologies, as well as Sycorax’s Daughters, a groundbreaking anthology of African American female horror writers. This is her first publication as a poet. Moore is a historian who lives in the DC Metro area with her husband and two boys and loves art, travel, classical guitar, and video games. Ask her nicely and she might tell you about her night in the “Hut O’ Terror.” To find out more, visit her at lhmoorecreative.wordpress.com.